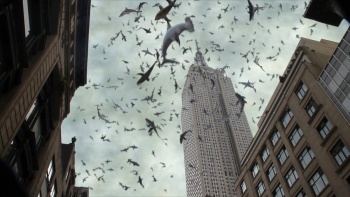 The sequel to Sharknado 2: The Second One makes the shark disaster films an annual event for Syfy. In a move that no one should find surprising, Syfy has officially announced that a third Sharknado film is in the works. Syfy premiered Sharknado 2: The Second One on July 30, kicking off "Sharknado Week". Sharknado and Sharknado 2 aired eight times that week, bringing 18.2 million viewers, and a record-breaking 3.9 million tuned in for the premiere. The third installment is due July 2015. With three films in as many years, Sharknado has become a yearly event for Syfy. If you're already itching for more Sharknado, the franchise recently made the jump to mobile gaming on iOS. Sharknado: The Video Game is an endless running game from Other Ocean Interactive. "The game we came up with is very much in the spirit of the films: ridiculous, overblown, yet oddly sincere," says designer Frank Cifaldi. "We can't wait for fans to sink their teeth into it." Sharknado: The Video Game was released July 29. The first Sharknado wrought its B-movie destruction on Los Angeles, and Sharknado 2 brought the chaos to the east coast by raining the apex predators on New York. Syfy hasn't revealed which major city can expect a rain of teeth and fins in the upcoming sequel, but given that east and west have already been covered, I'm rooting for an Alaskan adventure, or maybe a city on the Gulf of Mexico. Of course, Syfy could just give in to the ridiculousness and drop a school of sharks on Yellowstone National Park, in the middle of a super eruption. Or, if you'd rather be terrified of real animals raining down on you, check out the reality behind Sharknado. Where do you hope the next Sharknado touches down?